missing moments: Yards, movies and birds, oh my! Yards, movies and birds, oh my! The weekend seemed to flyyyyyyyyy by. Did it seem that way to you? I spent several hours on Saturday working in the yard. Trimming shrubs, cutting old tree branches and some not so old. Even cleaned the patio gutter which tends to clog more than the others. Afterwards, The Professor suggested we go see the latest Woody Allen movie, Midnight in Paris. It was Allen at his best with a comedic fable about dreams and reality, romance, love and nostalgia. I used to be such a fan of his until he took up with one of Mia's children and later married her. I believe he's still married to her so I guess I should get over it. But still. I'm dying to see Terrence Malick's new movie Tree of Life. Maybe next weekend. I recovered from all the yard work by hanging out in my home office on Sunday and catching up on *blog* stuff. There was a lot of action outside my window. I hardly could get any work done for picking up my camera and clicking away. 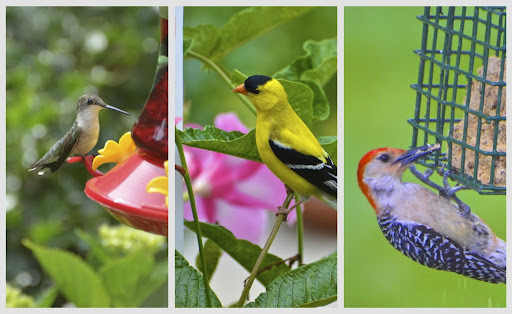 Female hummingbird, Goldfinch and Red-bellied Woodpecker. These guys are always hanging around. I wasn't fast enough to get the hummingbird and wasp dispute over the feeder. The wasp won, chasing the hummingbird away. Of course, there is bound to be some disagreements. I suspect the little goldfinch below is giving the hubby hell for fraternizing with the redhead. 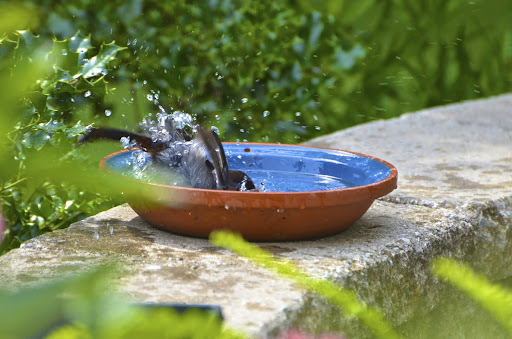 who stopped in frequently to bathe. life would be near perfect! OH, the simple joys in life. Hope your weekend was filled with simple moments. Love to hear about them. It sounds like the perfect weekend - a little outside, a little inside plus movies and beautiful birds! You seriously took these through your window? I'm really jealous now! But grateful you shared. Hope you have a great week, too! With so much beautiful real life action happening outside your window it's a wonder you managed any computer "work". LOVED the 2 goldfinches squabbling about the redhead! made me laugh!!! 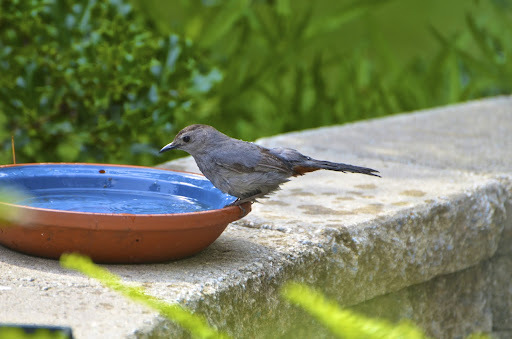 and the catbird is so beautiful! it had a good time! Reena~ this is bizarre! I found you somehow while posting for Mosaic Monday... heard you were from Philly.... ( nI lived on the Italian Market for about 12 years.. worked at Jeff and Pennsey..) now 5 minutes over the Ben..and place down the shore.. but moving to Fl. Plus.. My daughter who's name is Katerina... shortened it at about 2 bc she couldn't pronounce it.. to RINA.... AHHH! kismet! that keep away the smaller birds. I have been doing the same thing. Working in my yard with a camera in one hand. Love the bird in the water. Just love him. Wonderful shots. Amazing shots! Your commentary made me smile. The goldfinch fighting about the redhead was brilliant. 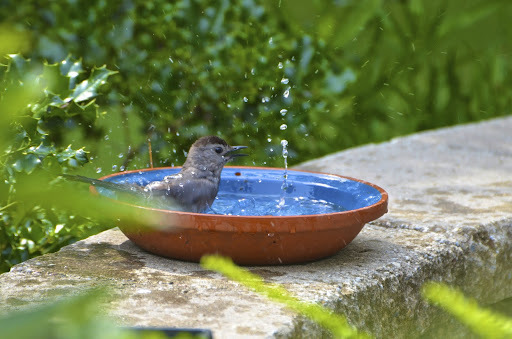 The catbird bathing was such fun! The birds are just gorgeous and so brightly colored!! WOW! What amazing captures and that little "catfight" caught in the box made me chuckle! I'll start off by saying that two of my three lenses were left back in my office this past weekend by mistake, and the only one I had with me up at the lake was my macro which I didn't even bother to take on the boat. (I mean, what macros are there to shoot on a boat??) Mind you, this is the ONLY time I've been on the boat that I can remember when I didn't have my trusty zoom (other than a few weeks ago when we had that surprise fireworks display). So wouldn't you know it, we think it was either a female bald (or golden) eagle and a red-tailed hawk that got into an airstrike with one another practically right over over boat! It was amazing! The shots I could have taken would have been to die for! The territorial battle went on and off for a good 15 minutes. At one point the eagle, who wasn't going to be shooed away that easily, dipped into the lake and caught itself a fish, then stood on the bank near us and ate it! Then after that show was over we heard a loud eerie calling and found out a little later it was a Common Loon floating in a nearby cove and crying for a lost one! Here's a youtube video of its call (and it sounded just like this) we NEVER see or hear Loons! I can sit and watch the birds all day. It looks like you had a very entertaining time watching all these birds. 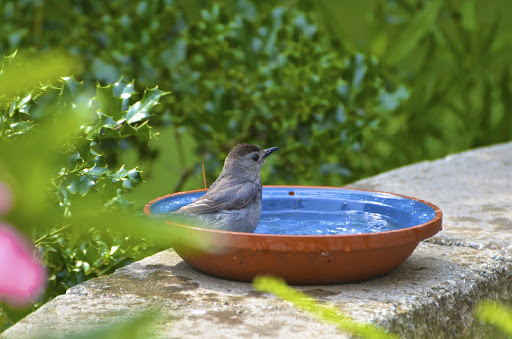 I love your photos of the sweet little bird and the bird bath. Lots of great action shots! Fun! I love what you see! Your photos Reena are great! This is what life is about.....the 'simple things'. Thanks for this. LOVE the new header and those birds .. especially the catbird bathing .. a delight! please put that bike on the bus and send it to me!! i love it. These are wonderful shots Reena! I especially love the little one in the water. It looks like it's having such a wonderful time. really hope to get to that movie! but unfortunately, it may be a while before i have a social life again. had to laugh over that little lovers quarrel! I am such a bird person! Not a day goes by that I am not taking photos of all my birds. We have many bluebird boxes and feeders around the property. They never fail to amuse. Loved seeing the grey catbird. 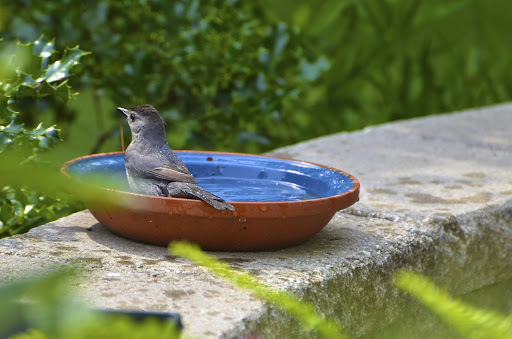 We have a nest with catbird babies right outside my kitchen window, where I stand to do dishes. I love watching the mom and dad come and go with assorted bugs and worms. I put purchased meal worms out for them and they gobble them up. Great photos and I feel the same way about Mr. Allen. 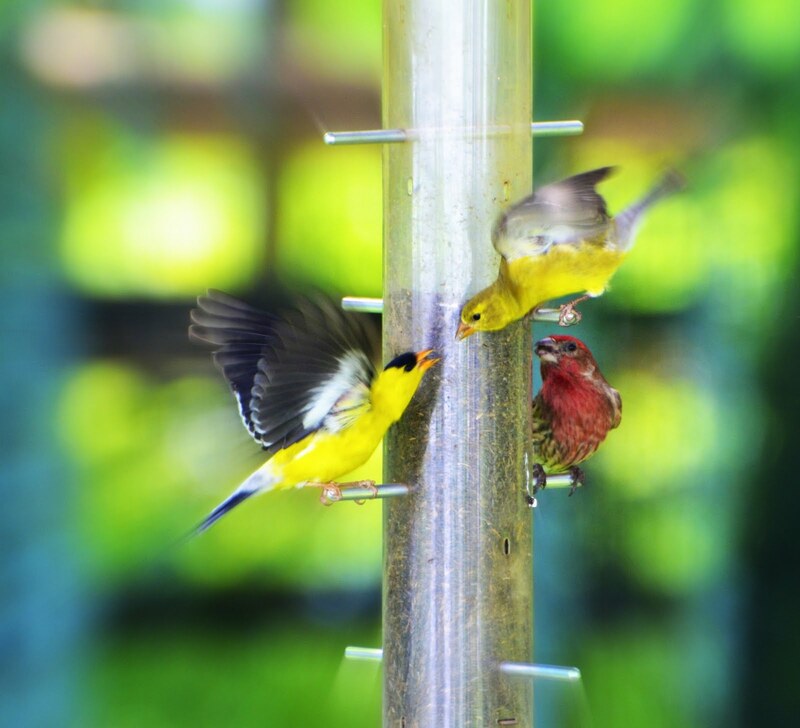 I love that shot of the gold and purple finches. 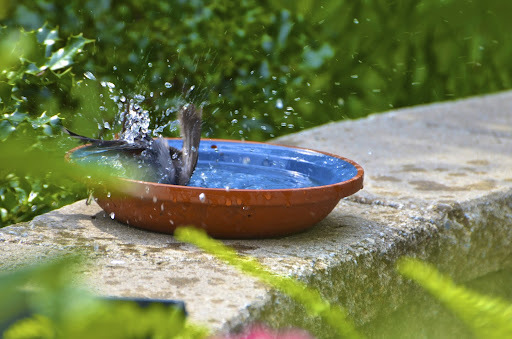 I really do need to invest in a bird bath too. How fun! nice pics - we don't get the woodpecker very often. They seem rarer than the others. So many fantastic captures! I really enjoyed this post! Beautiful photos. I loved your captions, too - especially the one about the goldfinches!